If your baby has sensitive skin, you are probably searching for the best baby bath products for sensitive skin to help soothe and protect his or her delicate skin. 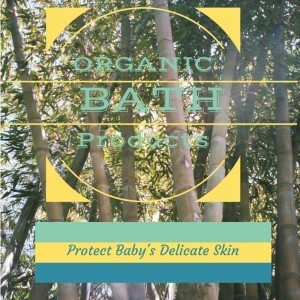 If you have never thought about using organic baby bath and products, you should consider them. Learn why below. Sensitive skin can manifest as an all over rash that never seems to go away, or as regular outbreaks of eczema and other skin disorders. It is always wise to check with your doctor before treating skin irritation at home. Some serious health problems can show up on the skin - and staph or yeast infections need to be diagnosed by a doctor. Once you are sure the problem is sensitive skin, you can start looking for ways to ease the discomfort and reduce the number of outbreaks. The first place to start is by looking at things that touch your baby's skin. Laundry detergents and fabric softeners are often the culprit. The perfumes and chemicals in these laundry products can lead to skin irritation. Take a close look at soaps, shampoo, powders, creams and other skin care products as well. If the skin care items either you or your baby use contain fragrances or other things your baby is allergic to, they can cause redness and rashes. Foods can cause irritation as well. If your baby is exclusively breast fed, your diet can impact their allergies. While only small amounts of food protein make it into breast milk, it can be enough to cause problems if your baby is sensitive. My daughter had stomach aches every time I had diary products while she was a baby. When I stopped eating dairy products, she felt much better! If your little one is on formula or has started solid foods, talk with your doctor about an elimination diet. Top allergens include dairy, citrus, wheat, soy and corn - although it is possible to allergic to nearly any food. By progressively eliminating potential allergens from your baby's diet you may be able to target a food or foods that cause a skin reaction. If your baby is having constant diaper rashes, the culprit could be something they are eating - or it could be the diapers they are wearing. Most people don't realize that disposable diapers are full of chemicals. From dyes and perfumes to super absorbent polymers, there are many substances in a disposable diaper that can cause severe diaper rashes. In addition, the plastic cover on the diaper can hold in heat and moisture, causing irritation. Disposable diaper wipes can also cause rashes. For many babies with sensitive skin, cloth diapers are a welcome relief from diaper rash. Cloth diapers don't contain dyes and perfumes, and they are more breathable than disposables. Simply by doing a few simple wash loads per week, you can save your family money and potentially reduce the rashes your baby is experiencing. Before bathing your baby you must decide on which soap and shampoo to use. While several popular brands contain parabens, petrochemicals, phthalates, synthetic dyes, and preservatives, organic bath products for baby are becoming easier to find and the leading choice for parents. Your child's skin is his/her largest organ. Skin soaks up products that are put on it. Do you want your child's skin to soak up genetically modified organisms, parabens, petrochemicals, synthetic dyes, etc. Products that are not natural and organic can irritate your child's skin and exacerbate (or even cause) dry skin or eczema. Bubble bath containing synthetic ingredients can cause frequent urination and a burning sensation during urination similar to a urinary tract infection. Natural and organic products — particularly those packaged in recycled (and recyclable) plastic bottles like ours are — help protect our environment in that they are manufactured with methods that are environmentally friendly and in many cases, with sustainable practices.